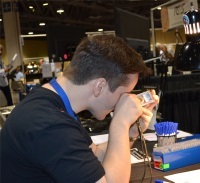 Collectors, dealers and young numismatists again will have the chance to test their coin grading skills and compete for prizes in the PCGS Coin Grading Contest. The newly announced competition will be held at the September 2015 Long Beach Coin, Currency, Stamp & Sports Collectible Expo, but interested participants should sign up now. The entry fee is $50 for dealers and their associates, $25 for collectors and free for young numismatists. The dealer with the highest score will receive a $1,000 check from Professional Coin Grading Service (www.PCGS.com). The highest scoring collector will receive $500 and the highest scoring young numismatist will receive a Mint State Morgan Dollar. "Responses to our previous grading contests have been excellent. We had to turn away several people who had not pre-registered for the last competition at the June Long Beach Expo because all the available slots were already filled," said PCGS President Don Willis. "So, don’t wait to register." The competition will be open to members of the PCGS Collectors Club, PCGS Authorized Dealers, PCGS Set Registry participants, PCGS CoinFacts subscribers and young collectors aged 16 or younger. To register for a contest time slot or get additional information, call PCGS Customer Service at (800) 447-8848, Monday through Friday between 7:00 am to 5:00 pm PST, or email [email protected]. Participants in the dealers and collectors categories will have 30 minutes to grade 20 coins, while young numismatists will have 20 minutes to grade 10 coins. "Once again, a variety of coins will be carefully selected for the contest, and evaluating each one will definitely challenge even the most knowledgeable collector," said PCGS Co-Founder and Collectors Universe President David Hall. The Long Beach Expo will be held at the Long Beach Convention Center, 100 S. Pine Ave., in Long Beach, California, September 17 – 19, 2015. Additional information about the show is available at www.LongBeachExpo.com.